As evidenced by the two RETROspective posts, the Aliens Quadrilogy holds a very special place in the heart of coal that powers yours truly. Nothing could contain my excitement for a prequel (even one that is "tangential") from this series and honestly, it was the only other film that I had wanted to see besides the impeding juggernaut that will be Dark Knight Rises this summer. This means that my expectations were pretty (pretty) high. 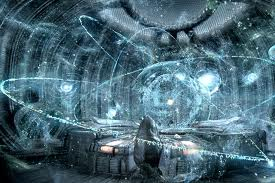 Prometheus at its very essence is a film about the question of human life. That is how did we come to be and what is our purpose. This yearning for insight has lead an expedition to a distant planet to meet our makers, referred to as Engineers. When Prometheus descends onto LV-223, it is clear that something is amiss that calls into question the role of the Engineers' role in creation and future of our species. 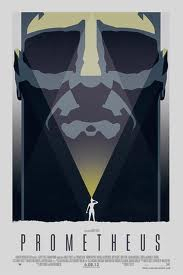 Prometheus as film is many things, above all, it is a beautiful (Nay, it is gorgeous actually) film. Dariusz Wolski's shot selection in conjunction with the special effects create some of the most compelling visuals that I have seen in a long while. Honestly, I can gush over the color selection these visuals and how they flesh out not only the time when Prometheus is set (and the Aliens universe as well) but we all have families to return to. Furthermore, the strength of Prometheus (besides the script) is the cast. Sure, Fassbender received a lot of notice (and rightly so since he is channeling Peter O'Toole ... Literally at one point) but I thought that Noomi Rapace did a wonderful job as her character found the strength or rather will to survive. 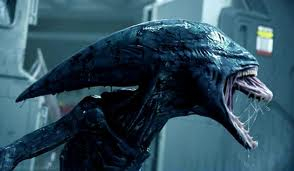 The complaint with Prometheus is that it is obvious that large chunks of the story were missing (most likely edited for time) such the Captain realizing that the creatures they found are biological weapons out of nowhere. Which has me quite excited for a director's cut release on Blu Ray. 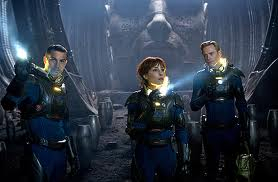 All in all, I thoroughly enjoyed Prometheus and it great to see Ridley Scott's return to form. That was not a dig, I enjoyed Body of lies, Robin Hood and American Gangster... You know the Russell Crowe trilogy.